It was quite the wedding season this year! At one point I had to stop answering the phone because all I could do was turn down work. I apologize if you were one of those who called me and couldn’t get through. As a one-person business I have to sometimes choose between completing the projects I already have and getting more work. 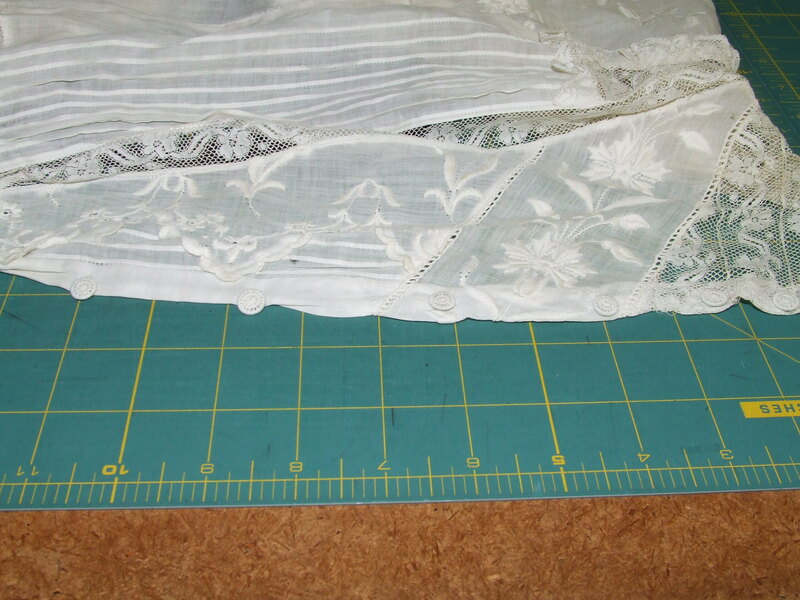 One of the projects I enjoy the most as a dressmaker is working with vintage and antique dresses. 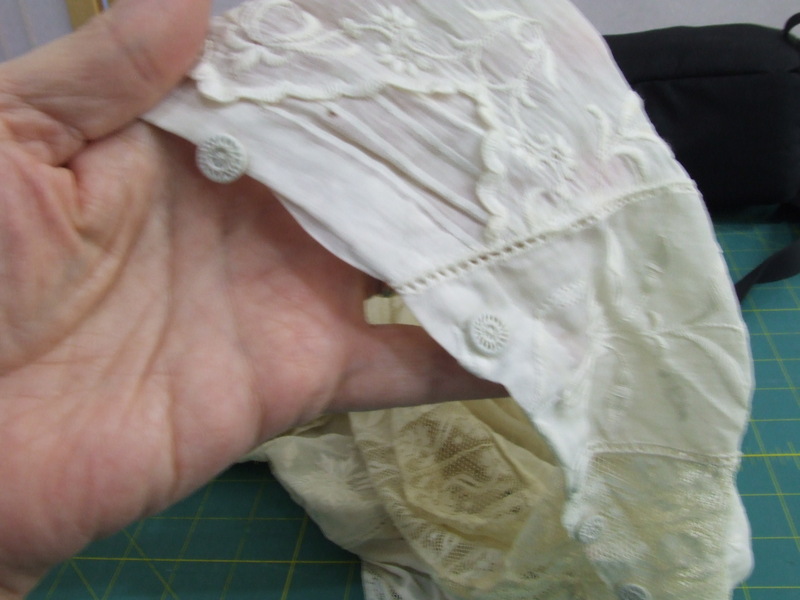 Whether it’s a wedding gown or a suit or coat, I do quite a bit of repairing and altering antique clothing. As I’ve written about before, when dealing with antiques, I like to really take my time and think through the project before I begin. It’s just too easy to go forward too quickly and make a grievous mistake. Even the most cared for garments are fragile and usually have rips or stains. 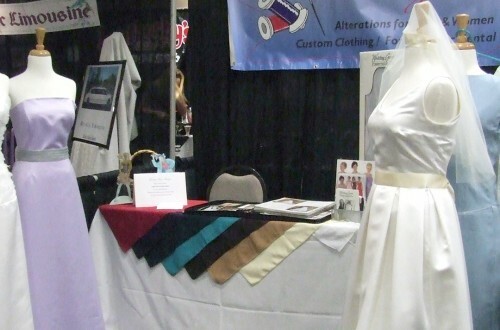 The dress pictured above was worn by the bride’s mom in the 1980’s. She bought it at an antique shop and best guess is that it is about 100 years old. 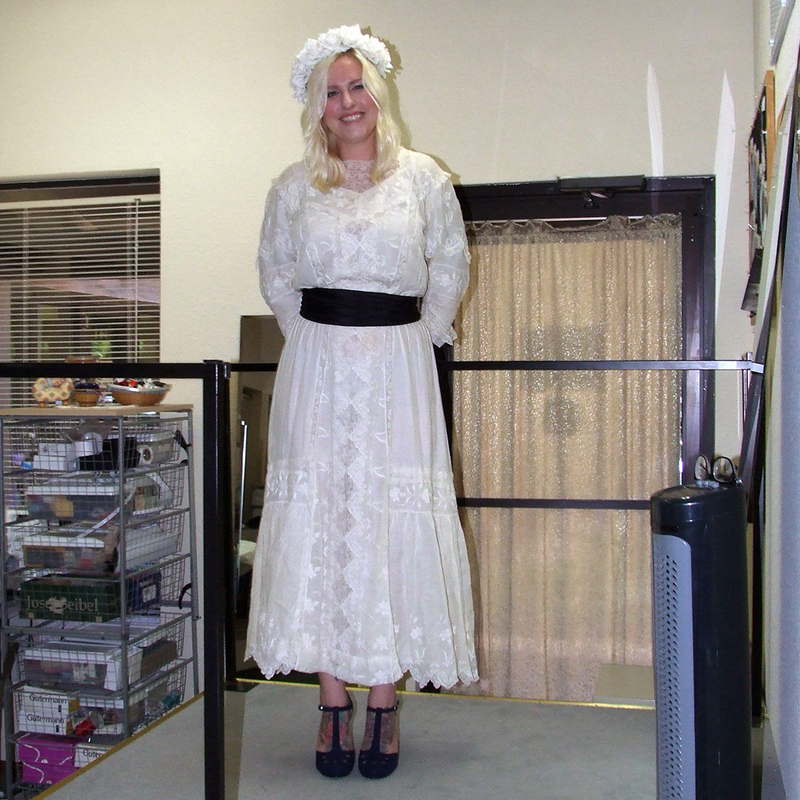 The bride wanted to carry on the tradition but it needed a lot of work! You can see the rust colored stain on the very sheer fabric. The cotton voile was fragile and had some stains. 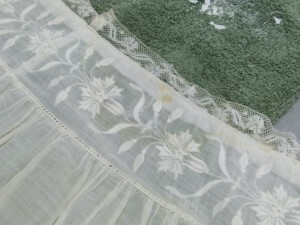 The lace was delicate and had rips and stains. 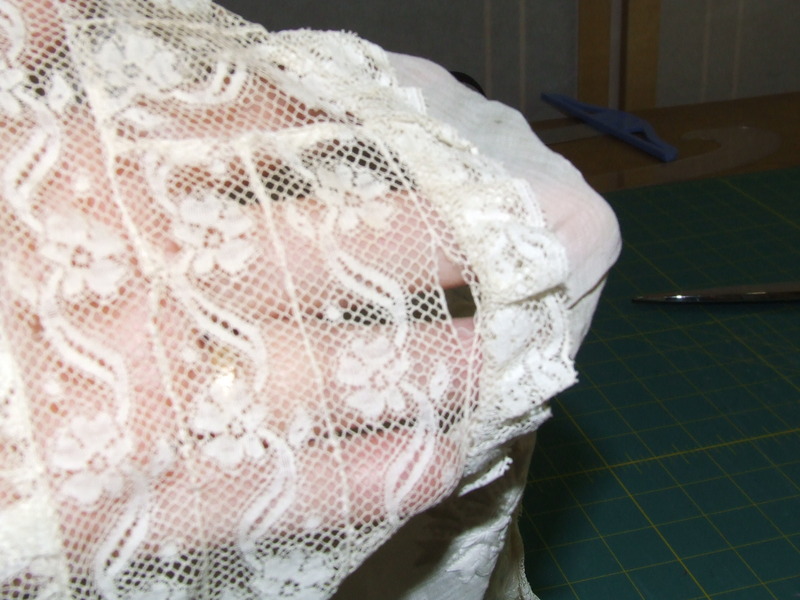 Here is one of the many rips in the lace I had to deal with. The waistband of the dress was completely ripped up but fortunately, the bride planned on wearing a sash. I reinforced the band with silk habotai. I lined the whole dress with the habotai to compensate for the sheerness and use it to reinforce the stress areas of the dress and yet still keep it light and airy. For instance, the bottom ruffle (which was shortened so her shoes would show) was re-attached to the skirt and the lining so that it wasn’t hanging from the skirt alone. I also attached the shoulders and sleeves to the habotai to reinforce those areas. 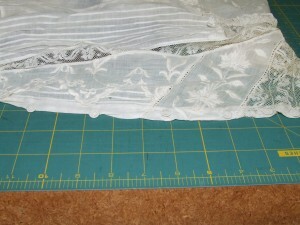 When dealing with the stains, I tried out a spot that I knew was going to be removed when I hemmed the dress. I VERY GENTLY rubbed a small amount of baking soda into the stain and that was all it took to shred the fabric. I then decided to just try soaking the stains with baking soda and it didn’t remove the stains but it lightened them enough so that they got lost in the volume of fabric. 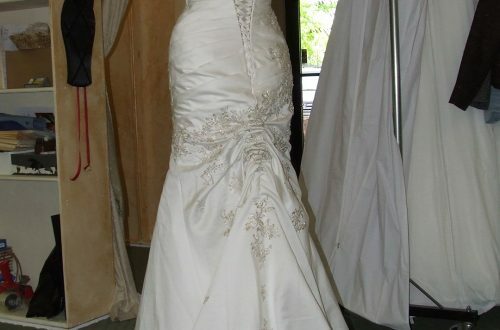 This is a close-up view of the back of the dress. You can see the embroidery and the crocheted buttons. Here’s a close-up of the buttons.